I woke up early, about 6:30AM. In the shower my mind wandered. Other game ideas tempted me with throwing everything away and starting again. I reminded myself I wasn’t trying to make something good I was just trying to make something. So I decided to go for it and got back to work. The issue I was having trying to get the flag looking how I wanted took about an hour. Now fully rested my mind could think through things more competently without getting confused. I worked throughout the day without a plan, just adding things as I thought of them. The game had no point so I added some crowns to collect which did nothing but give an appealing chime sound. I added some events that occur as you wander through the game to add a bit of interest and the game was shaping up to be a kind of trippy dream sequence. I knew the only thing that would make this worth playing would be if it had some music to create atmosphere so I knew I needed to get onto that asap. I’d never created a music track before so I looked up a free browser based music creator and found AudioSauna. It did the job but with some frustration due to the lack of an undo function. It is easy to accidentally delete whole sequences and then have to completely remake them. I did the best that I could in the time and I was pretty happy with the result. One reason I’m excited about game development is it gives me the chance to make music to go with my visuals. I can’t wait to do more. As soon as the music went in there was life to the game. I think audio is probably the most important thing in a game for creating a breathing atmosphere and world. You can have the most basic graphics eg. Thomas Was Alone – but as soon as you add quality sound to them they immediately expand into a whole new dimension. I think by mastering sound it would be possible to save alot of work on the visuals for a project. So I spent the rest of the day finishing up some details and working around some other things I had on during the weekend. I managed to complete the game on time with a few seconds to spare before learning about the one hour upload period. In total I spent around 20 hours on the game and can see in the future when my skills are more developed that it would be possible to make something a bit more substantial if I was to use more of the 48 hours. All in all Ludum Dare was an amazing experience and really forced me to face reality. The energy on the website of thousands of developers constantly updating with their progress was something unlike I have been involved with before. Ludum Dare is truly something special and I cannot wait to get back into it in April and try to make an actual game next time. Road To Zion turned out to be more of a brief atmospheric art piece than a game and had little to do with the theme although I had it in mind at the beginning. 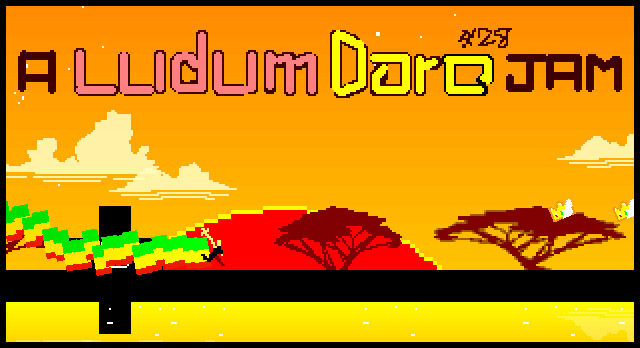 Game Jams are amazing things and I’m glad Ludum Dare #28 was my initiation. I’m planning to participate in Global Game Jam at the end of the month and then the next Ludum Dare also. This past weekend I participated in the popular game jam Ludum Dare. It is a competition to build a game in 48 hours to a theme that is voted on and presented at the beginning. All assets from sound, music, art and programming had to be created within the 48hours by one individual with whatever tools they liked. My goal for the jam was to simply participate and try to complete the most basic thing possible. I had not yet made any finished games and am still learning programming so I knew finishing a game of any kind was going to be a challenge. I envisioned an epic widescreen slo-motion shot of a tiny character running across the screen with a trailing Ethiopian flag behind him and holding a crucifix scepter and crown. Most things I make have pyramids so a chucked a few of them in there to create a psychedelic African landscape. The specifics of what would happen in the game other than running was still a mystery but I decided to just dive into Gamemaker and start creating it. I started in Gamemaker by just getting some blocks moving. I created the ground object and built a crude level including the pyramids. Next I programmed another block that would be the character. This was relatively easy as I have been doing alot of this already in my Shark Slam game and all I really needed to add was a jump button and some gravity and collision detection. 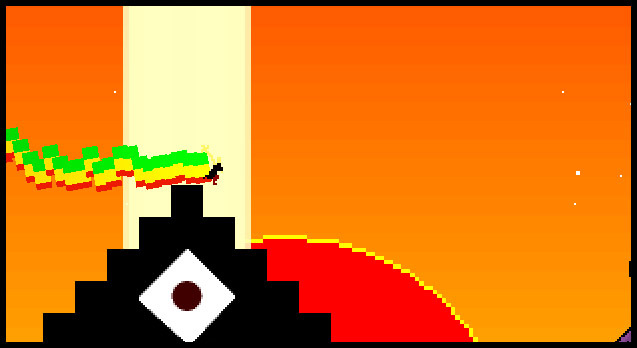 When the character was moving sufficiently I added in some temporary graphics for the sky and made a rising sun. I made most of the graphics in Gamemaker and with the mouse. I thought I might go back later and do some better ones but decided to finish the game first and do it only if I had time. Although part of me was really interested in achieving an abstract beauty by just using really raw pixel art. Next I spent way too long trying to get the aspect ratio right. I wasn’t fully conversed with how Gamemaker’s view system worked and ended up with some warped screens. I noticed most of my problem was due to an optical illusion that made my square character look squashed as it fell out of the sky. This caused me a lot of headaches until I realized it was correct after all. Once the aspect ratio was sorted I moved onto the next crucial component – the drifting flag. At this point I was starting to get tired as I had had and early morning. I got a particle system going for the flag but it wasn’t working correctly. I was trying to get it to look like it was waving in the wind and also had physics for when the player moved. This turned out to be a major pain. I tried for about 2 hours to get it working how I wanted but it just wasn’t happening. I was getting really tired and frustrated and suddenly felt a panic coming over me. I felt like I was going to fail and wouldn’t be able to finish anything in 48hours. I had a feeling like I really hadn’t learned anything this year and I was useless and this jam was really showing my how incompetent I really was. I wanted to give up. I wanted to quit. I went to bed defeated.